Once you have it printed, cut it out. Don't worry about the ? mark just yet, only cut around the perimeter of the square. 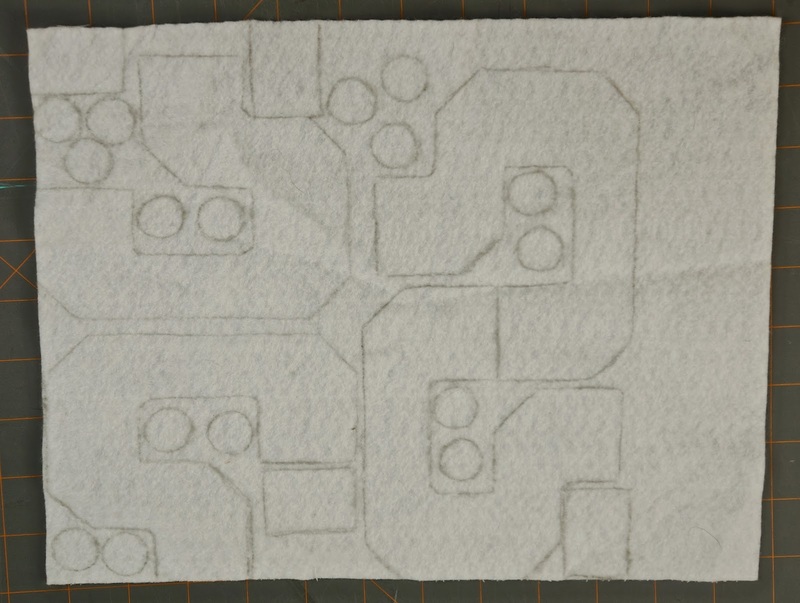 Now begin to trace the square onto some cardboard or foam board. 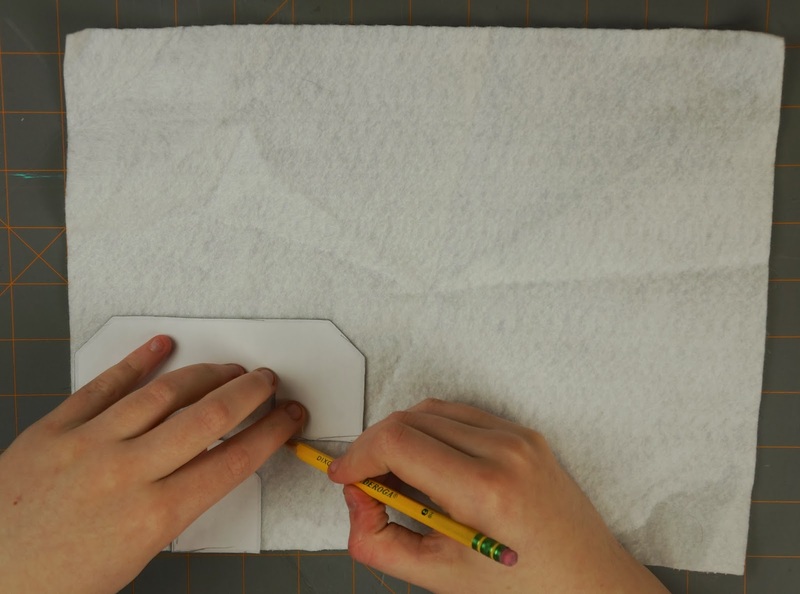 The template will give you the size, but you'll probably want to go over your lines with a ruler to make sure their straight. 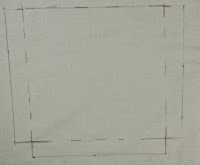 Trace 5 squares. 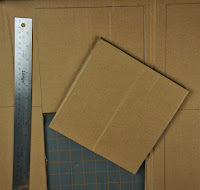 Once you have 5 squares traced out onto your cardboard, begin cutting them out. Make sure to protect your surface when using a knife. 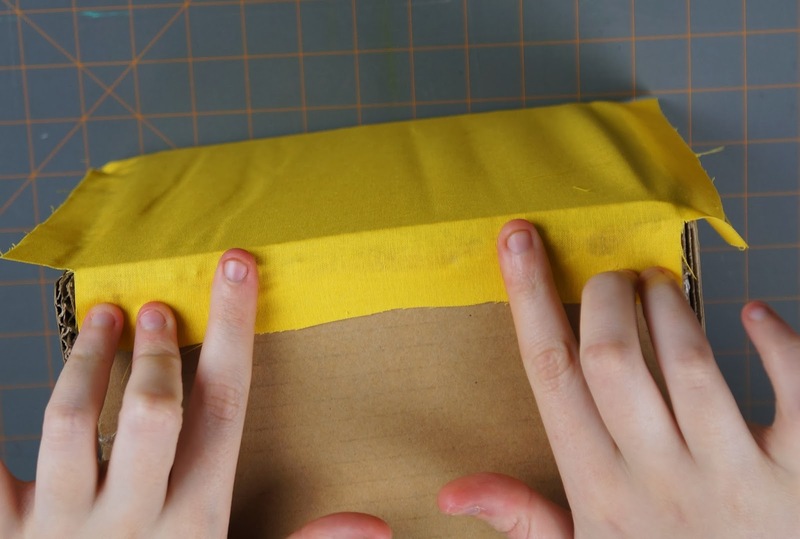 Using a ruler when cutting will assist you in keeping the line straight. 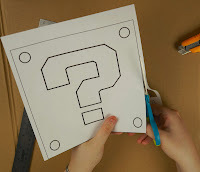 Using a hot glue gun, begin to glue the squares together to form a cube. 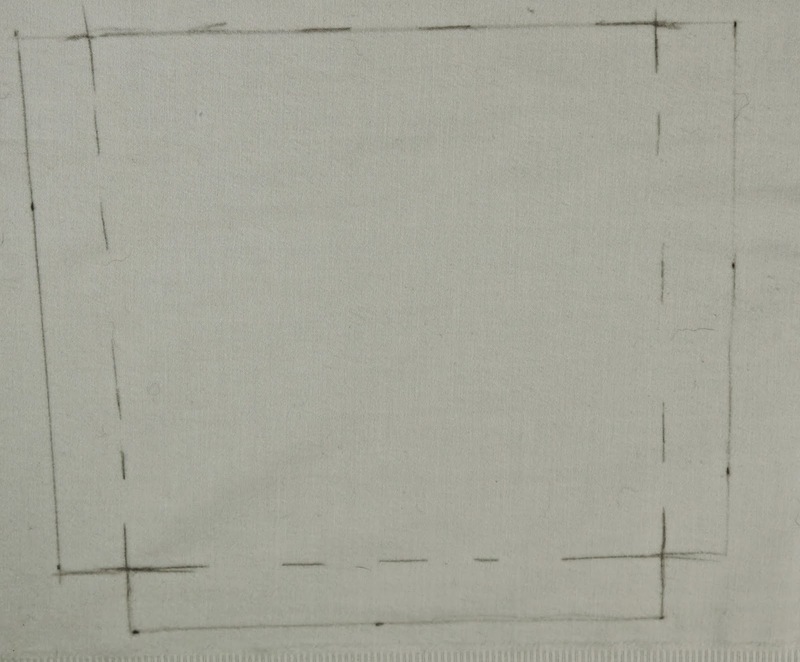 Now take your white fabric and your template and begin to roughly trace the square onto the wrong side of the fabric. 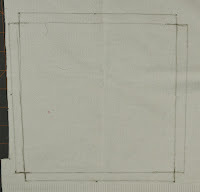 Next, take your ruler and measure and mark 1" from the edge of the square. 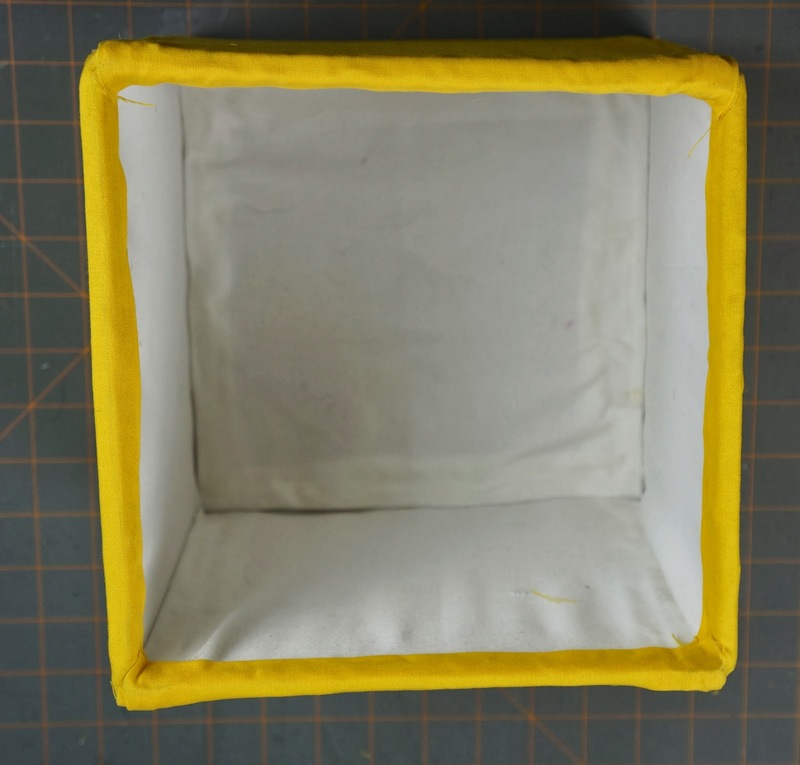 Do the same for 2 other sides so that 3 out of the 4 sides have an extra inch. 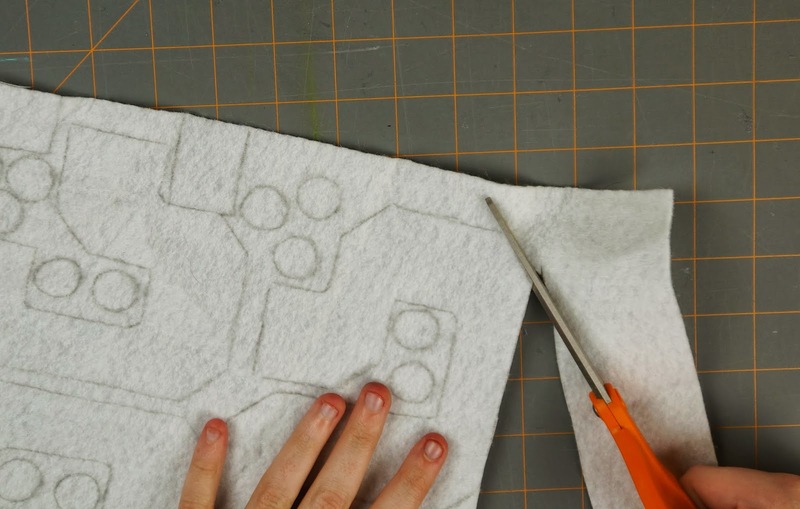 Do the same thing for another piece, then cut them out. 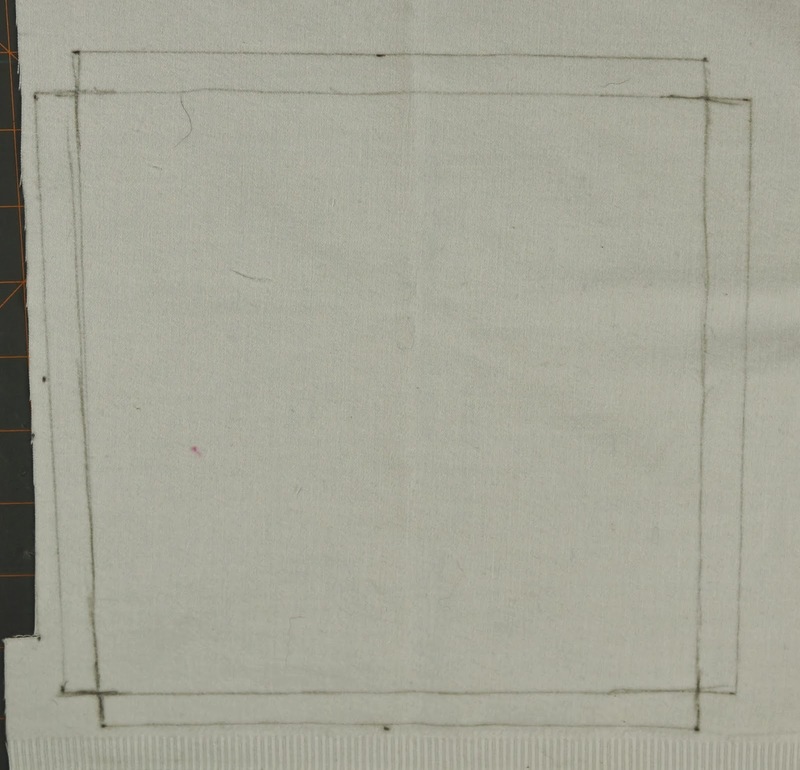 Start off the same way again, by roughly tracing the template onto the fabric. This time add only half an inch to 2 of the sides and an inch to the bottom side. Do the same thing so that you have 2 of the same size piece, then cut out the 2 pieces. 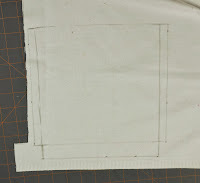 For the final white square, add half an inch to all 4 sides, then cut it out. You only need one of these. 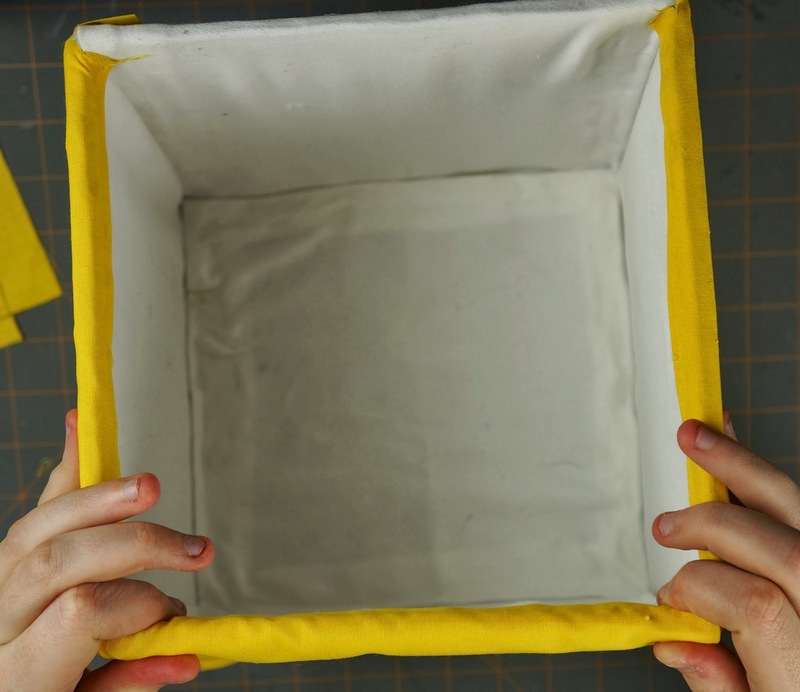 Begin to cover the box by taking one of the squares that has an extra inch on 3 of the sides and gluing the side opposite the side that has no excess to the bottom of the box. Make sure to glue the right side up, you don't want to see the pencil lines. 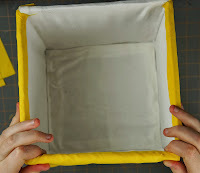 Then glue the other sides with the extra inch to the sides of the box. 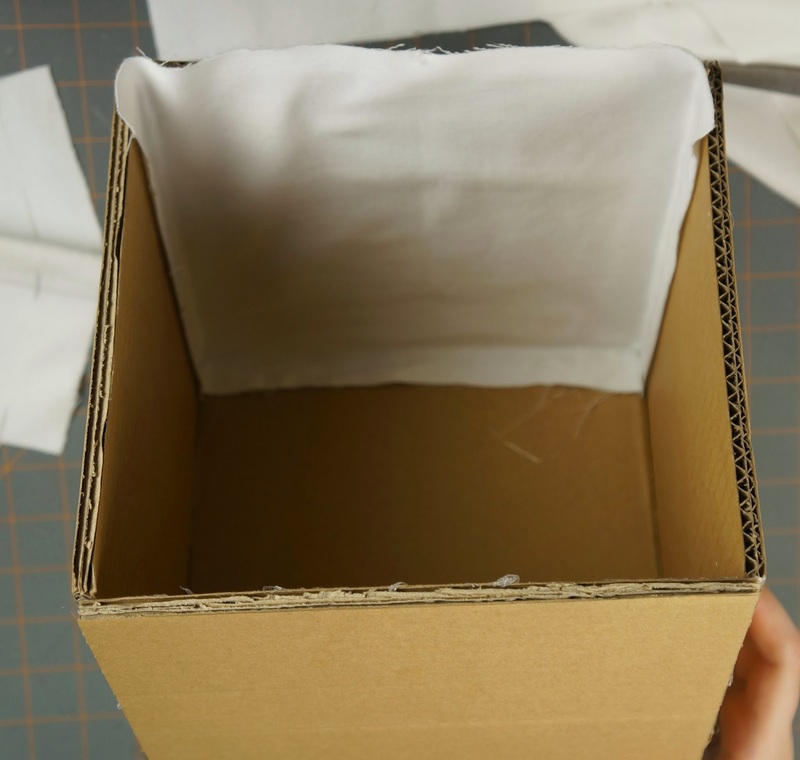 There might be some excess over the top, cut a slit in the corner of the fabric and fold the excess over the sides of the box. Do the same thing for the piece of the same size, gluing it directly opposite to the other one. Now take one of the pieces that has half an inch on two of the sides, and begin by folding the half inch sides and gluing them to the wrong side of the fabric (side with pencil lines). 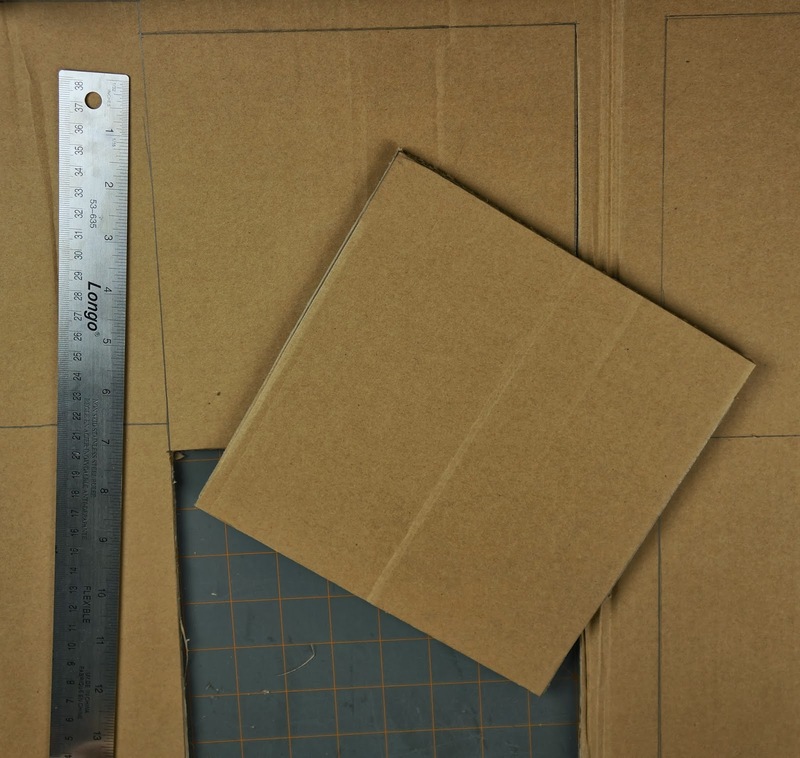 Again, start by gluing the extra inch bottom to the bottom of the box. 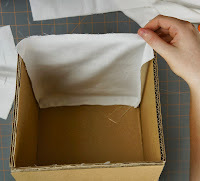 Then glue the rest of the fabric to the side of the box, make sure it's pulled snugly. 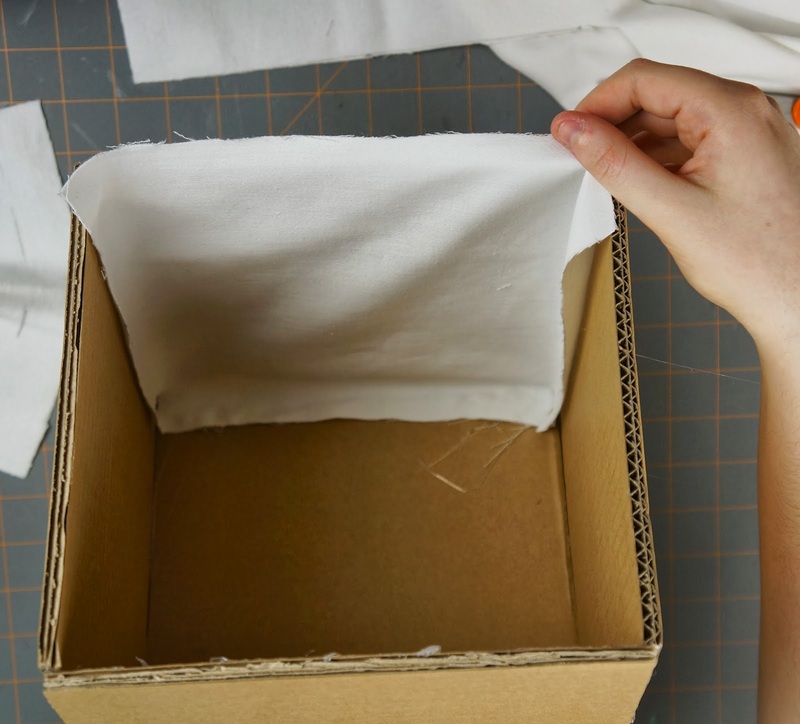 Then any excess fabric at the top of the box can be glued over the side of the box. 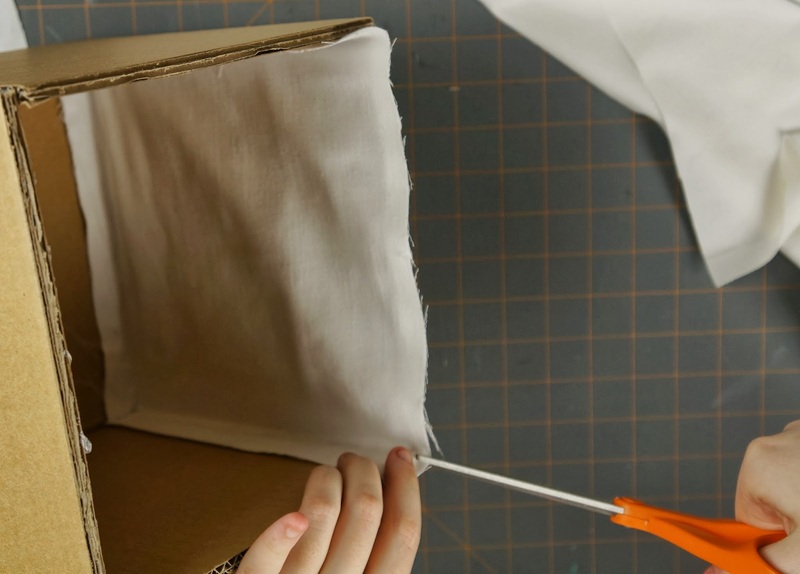 Do the same thing for the same size piece, gluing it to the final inner side. 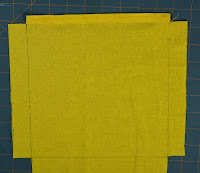 Take your final white piece and fold and glue all 4 half inch sides down to the wrong side of the fabric. Then glue that piece to the bottom of the inside of the box. 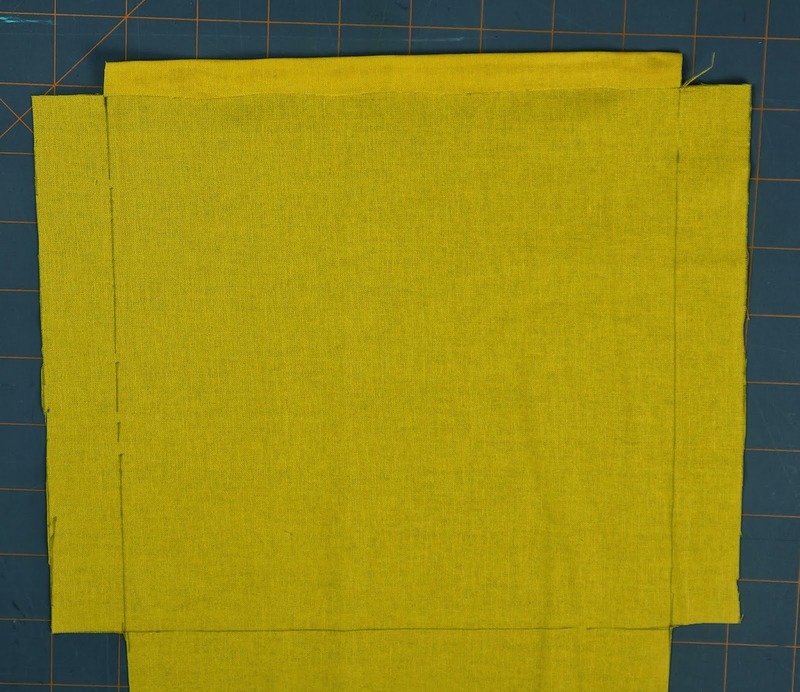 Then we're going to do the same idea with the yellow fabric. Start by roughly tracing the template onto the wrong side of the fabric. 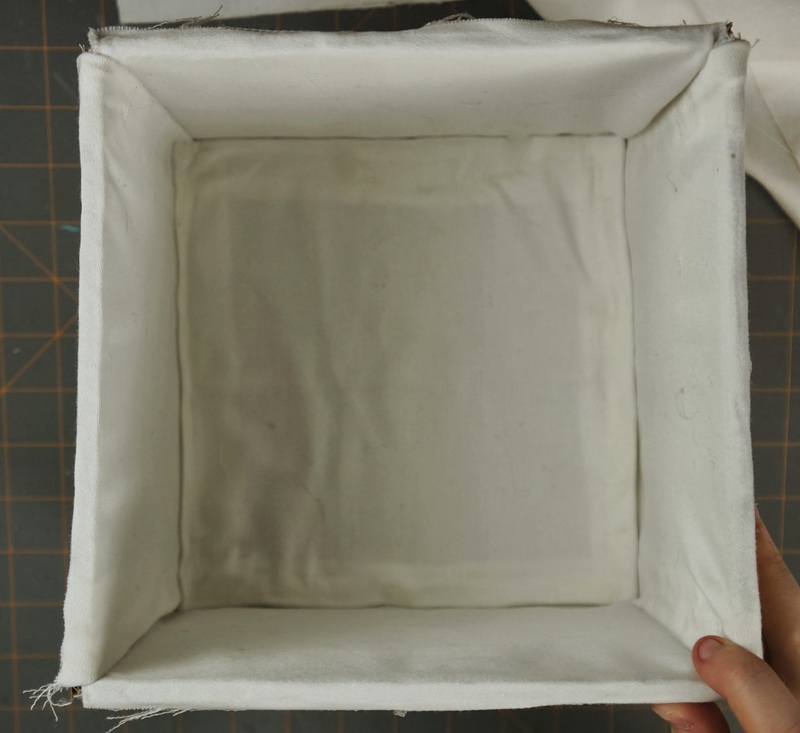 This time you want 2 pieces that have an extra inch on all 4 sides, 2 pieces that have an extra inch on 2 sides and half an inch on the other 2, and a piece the same as the piece used for the bottom of the box with half an inch on all 4 sides. 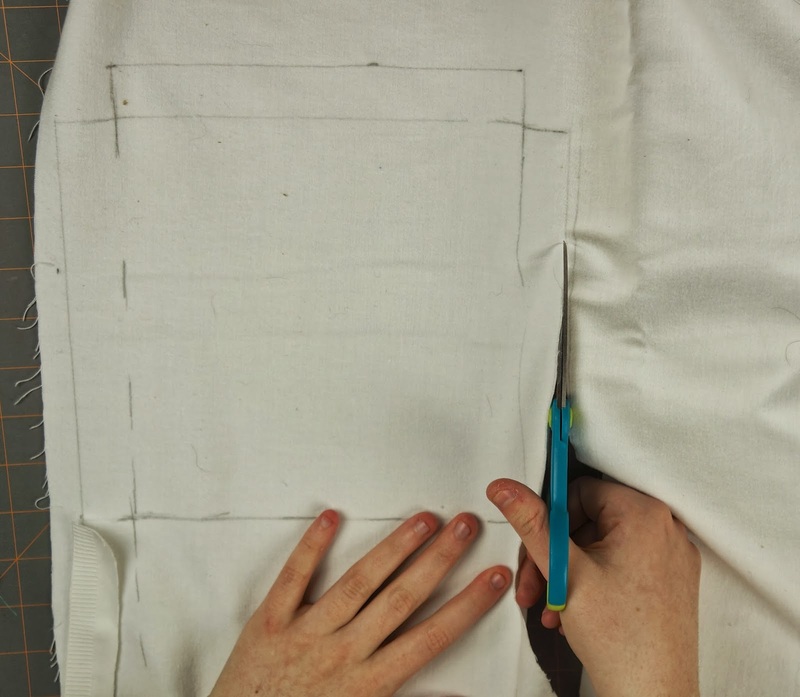 Start by taking one of the pieces with an extra inch on all 4 sides and folding one of the inch sides in half. 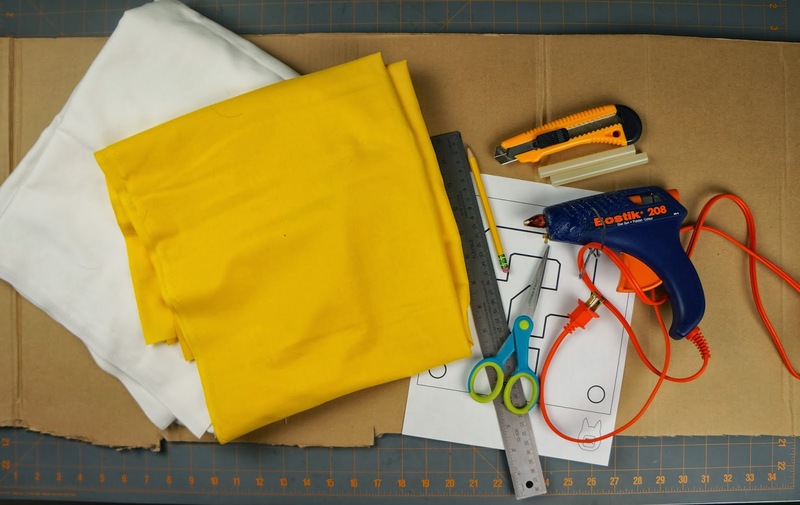 Glue that down on the wrong side of the fabric so that you have a doubled up extra half inch on one of the sides. Glue that doubled up piece to the inside of one of the sides of the box. 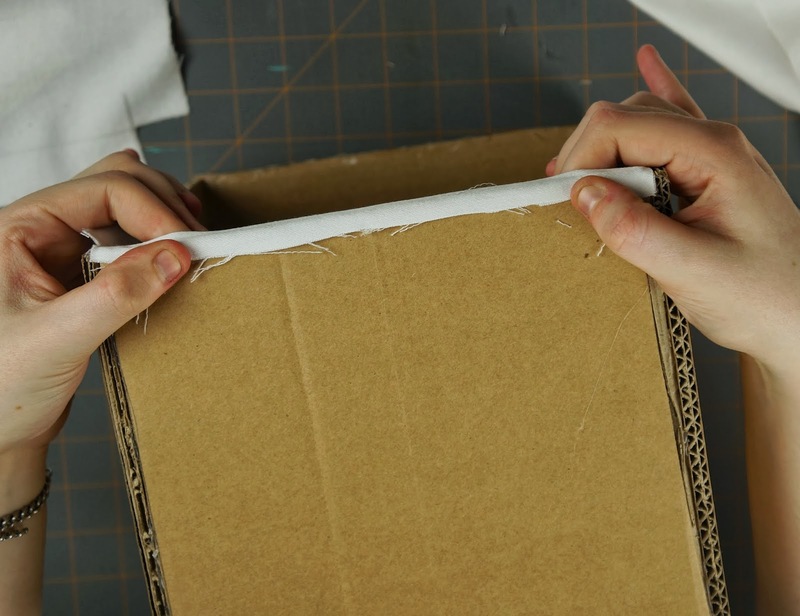 Then glue the extra inch directly opposite, to the bottom of the box, make sure it's pulled tight. 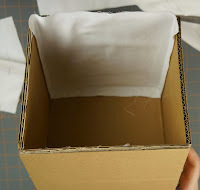 Do the same for the other extra inch sides so that the fabric is pulled smoothly against the cardboard box. 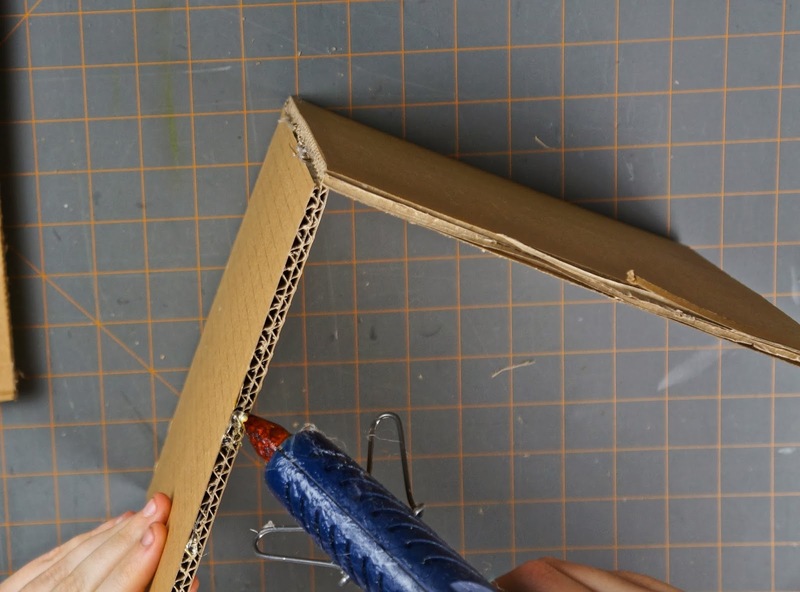 Do the same thing for the other piece of the same size, gluing to the opposite side of the same piece. 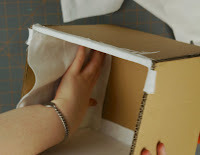 Again, start by glueing the folded half inch (side opposite the extra inch) to the inside of the box. 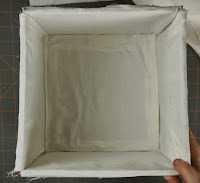 Then pull your fabric tightly and glue the extra inch to the bottom of the box. 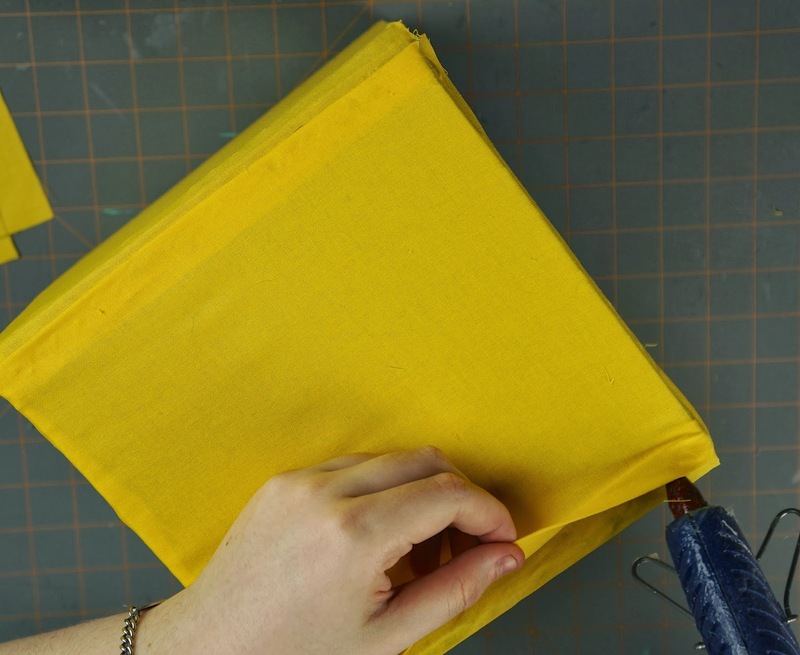 Then you can go back and add some glue under the folded edges. 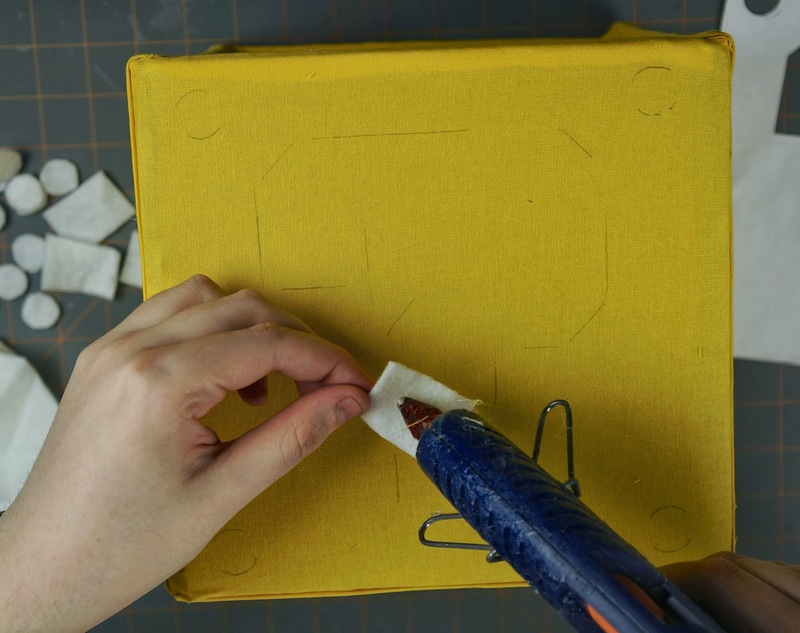 Do the same thing for the same size piece, gluing it to the final outer side of the box. 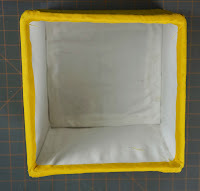 Finally, take your last yellow piece, and just like the bottom of the inside, fold and glue down all 4 extra half inch sides. 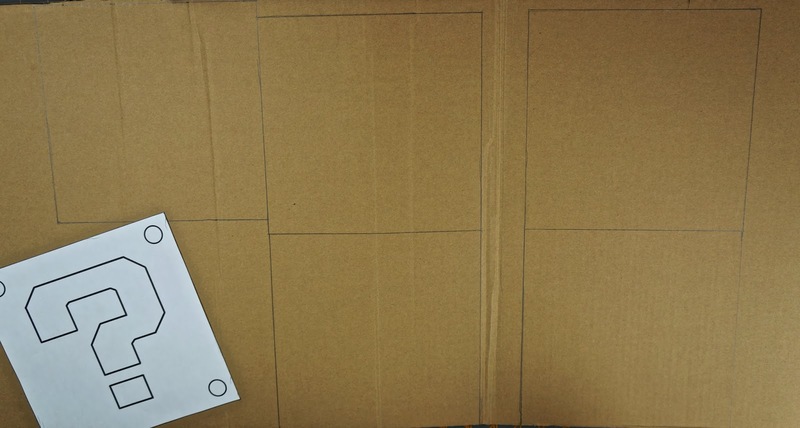 Then glue the piece to the bottom of the box. Now we can cut out the rest of the template. 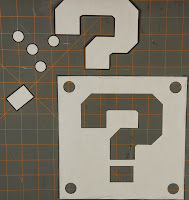 Don't throw any of the pieces out, we will be using both the cut out shapes and the square. 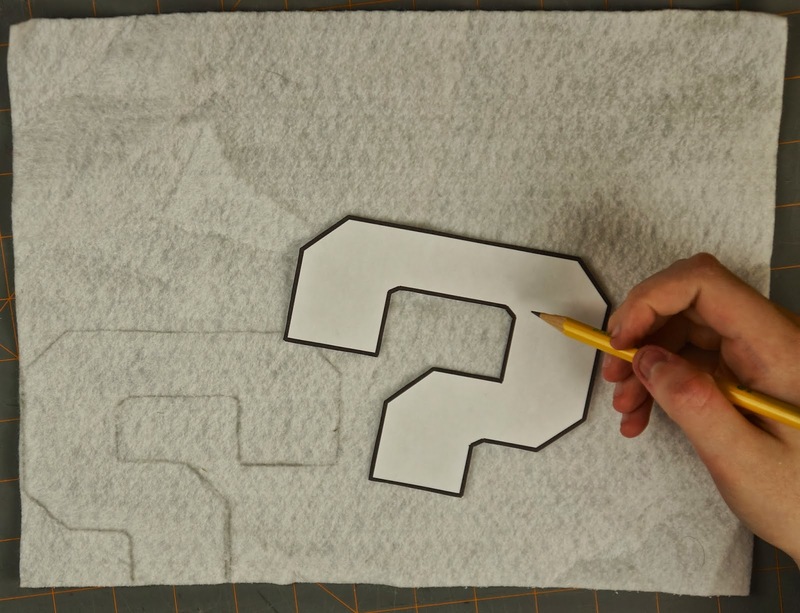 Taking your white felt, begin to trace the shapes on the wrong side of the fabric. Make sure you trace the ? 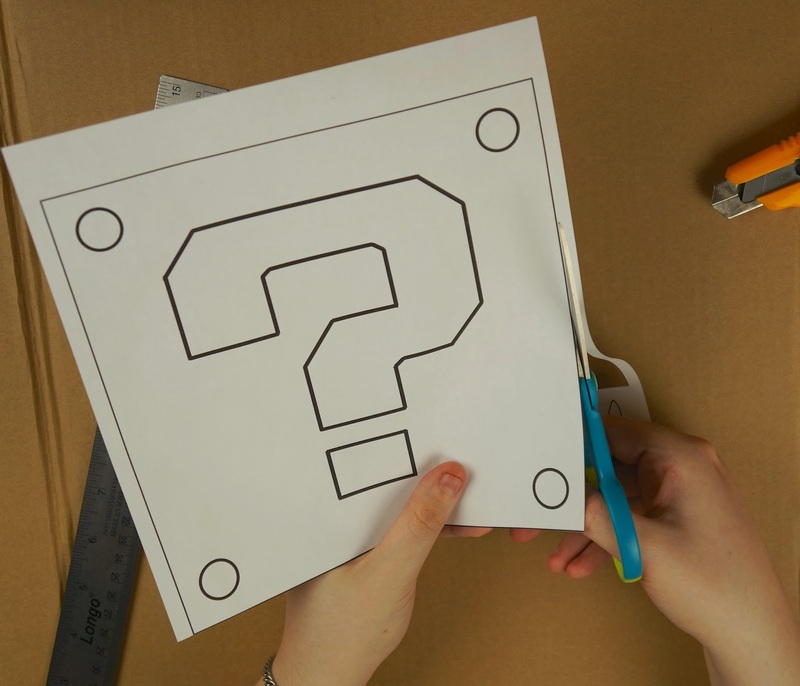 mark backwards so when you glue the pencil side to the cube, the ? mark is facing the right way. It doesn't matter which way you trace any of the other pieces, they're symmetrical. 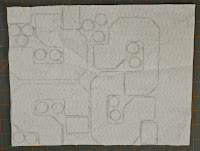 Trace enough pieces for 4 sides, then cut them out. You should have 4 ?, 4 rectangles, and 16 circles. 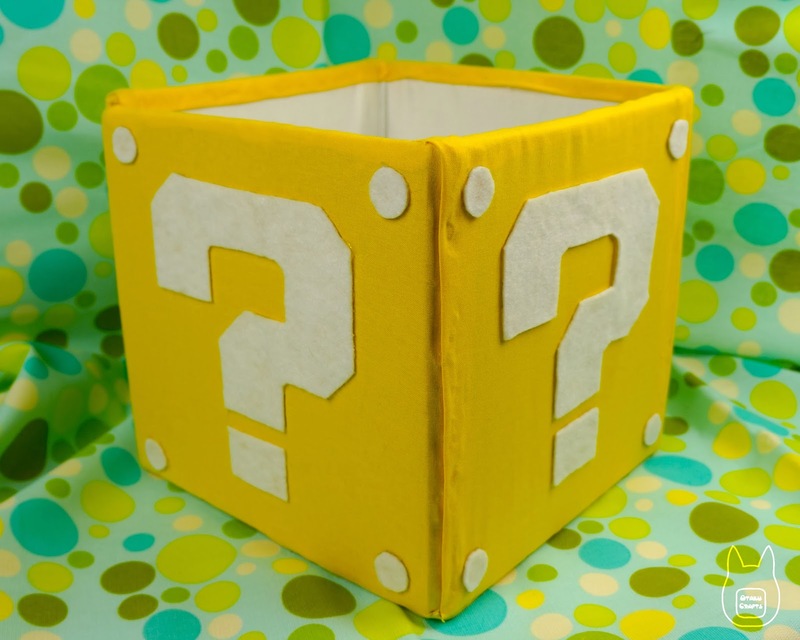 The bottom of the cube will be left blank. 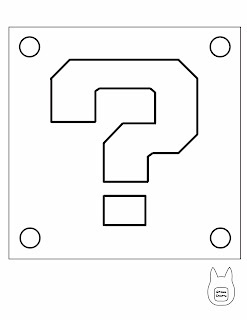 Now take the cut out square part of your template, and line the square up with one side of your cube. 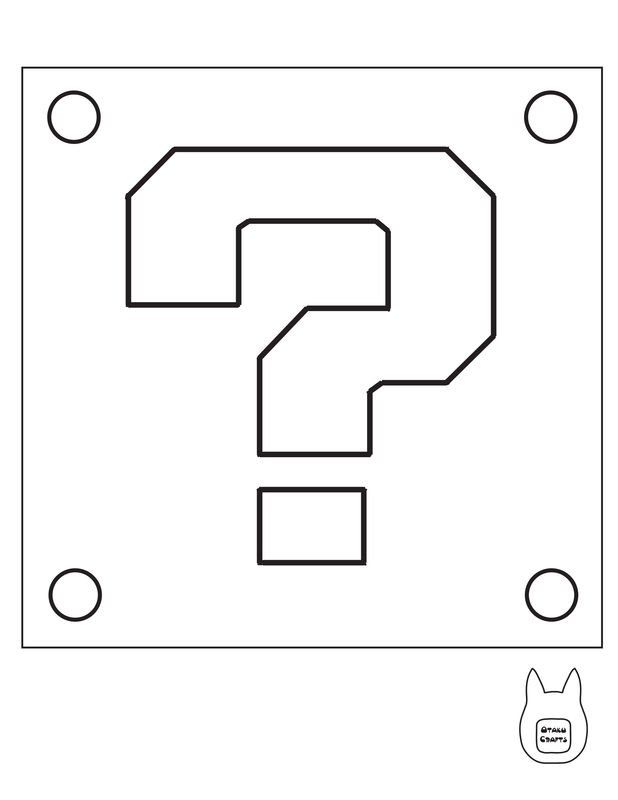 Then lightly mark the outline of the shapes to help you place the pieces. 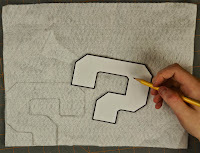 Then start to glue the felt pieces down, make sure you are gluing down the side that has the pencil marks on it. Do the same for all 4 sides of the cube. And you're finished! Now you have your very own ? 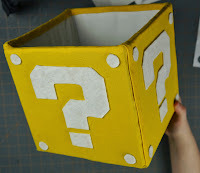 block storage cube. Perfect for holding video game controllers and disc cases!